Schools working to raise student achievement need the help of an organized, focused central office. Yet many districts lack unified direction, agreement on the central office role in supporting school improvement, and coherence and alignment between goals and strategies. Drawing on the findings of a three-year study of several districts focused on improving their schools, this book is intended to help central office leadership and staff examine their organizational arrangement, their enacted roles, and their day-to-day activities, critically questioning both their theories of action and how their work is concretely helping the schools they serve. Chapter I explores the constraints under which districts operate, addressing the impact of local context, federal and state policy, a district’s governing board, and local and national organizations. Chapter II deals with how districts can move forward, developing a cohesive central office theory of action with aligned roles and functions. Chapter III turns to the topic of supporting school improvement through implementation of aligned structures. 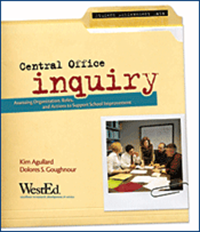 The book includes exercises and activities designed to engage staff in this inquiry process. This descriptive analysis, prepared by REL West, provides a statistical profile of California’s Title I school districts in program improvement. How can a school district positively impact achievement in all its schools — even those most challenged? This summary report was commissioned by the U.S. Department of Education from a research study of nine award-winning districts. This descriptive analysis, prepared by REL West, provides a statistical profile of Arizona's lowest performing school districts, which can inform the context for district improvement as Arizona rolls out and refines its district intervention strategies.